HUMBOLDT BAY: Humboldt Bay is the only deep-water port on California’s North Coast, serving as a major transportation link between the Pacific Northwest and the entire world. 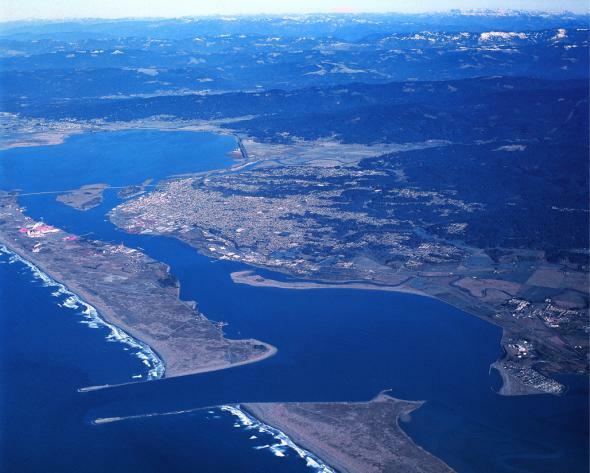 As California’s second largest natural bay, Humboldt Bay also overflows with a wide range of natural resources, recreational activities, commercial fishing opportunities, and conservation programs. 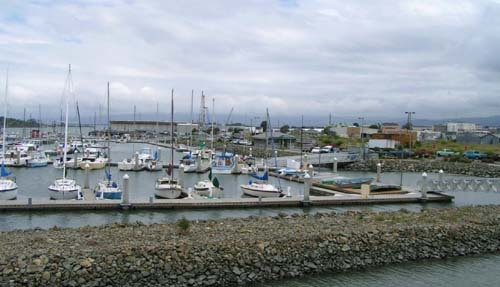 Woodley Island Marina is the largest marina on Humboldt Bay. Woodley Island is also the headquarters for the Humboldt Bay Harbor, Recreation and Conservation District. This full-service marina provides slips for commercial and recreational vessels, guest docking facilities, hoists, work area, café and bar, laundry, ships chandlery and boat sales, rentals and lessons. The Eureka Public Marina is located at 500 West Waterfront Drive. The Marina includes 150 boat moorage slips that accommodate vessels from 20-70 feet in length. Amenities include a two lane launch ramp, fish cleaning station, parking area, public restroom, tenant shower building with coin operated laundry machines, and a waste oil disposal facility. Water and electricity is provided to each slip. The Marina Office is located at the west end of the complex in the Wharfinger Building at #1 Marina Way. TRINIDAD HARBOR: Trinidad Harbor, a small cove E of Trinidad Head, affords shelter in NW weather, but is dangerous in W or S weather. The cove is small and is further constricted by several rocks, and, as a rule, there is always a swell even in N weather. It is used by fishing boats to a considerable extent during the summer, even though the holding ground is only fair. A white lighthouse structure, a memorial containing the original oil-burning light used at Trinidad Head until 1948, is at the center of the bluff on the N side of the harbor. A pier with a bait and tackle shop, and restaurant is located in the bight W of Little Head. A small marine railway near the foot of the pier is used for launching and retrieving small craft up to 25 feet long and 8½ feet wide. A beach boat launch is located on the E side of the marine railway. A water taxi is available during the summer months and a floating pier is provided to access the main pier during the months of May through September. Gasoline, marine supplies, and ice are available in Trinidad, a town on the N shore of the cove. The harbor monitors VHF-FM channel 78. Samoa County Park – Boat ramp to Humboldt Bay and RV camping. Eureka Bridge Boat Ramp located under bridge off Waterfront Drive. Grizzly Creek Campgrounds – River access and camping on the Van Duzen River. closed in winter. The primary fish of interest for the Eel include steelhead, chinook, coho, and sea-run cutthroat trout. Chinook start coming into the river in August. They tend to hold in the waters below Ferndale Bridge until rains allow them upstream. The run is from August through December, with the peak in late October. The Eel flows through some of the most beautiful redwood groves in the state, including Humboldt Redwood State Park. Winter steelheads are what the Eel River is known for. The winter steelhead start moving into the river in November running through March, with peak activity during January. The average Eel steely runs 8-10 lbs, with fish to 16lbs common and a number of fish in the 20lb class caught each year. A tributary, entering the Eel at Alton, and like the Eel it’s noted for good runs of salmon and steelhead. Runs Coincide with the Eel. The Mad River is located 15 miles north of Eureka in Humboldt County. It originates at Ruth Lake about 100 miles to the southeast. The species of the Mad include steelhead, chinook and coho salmon, and resident trout. The Mad has become known for its excellent winter steelhead, due in large part to the operation of the Mad River Fish Hatchery, which is located one mile southeast of Blue Lake on the south side of the river. The upper two miles of the river, from Lewiston Dam down to the Old Lewiston Bridge, is open only to fly-fishing. The wild and majestic Smith River is located on the Pacific coast of northern California near the Oregon border. It was named for the explorer Jedediah Smith. The free flowing, emerald-green waters of the Smith River are none like you’ve ever seen before. The Smith is the largest wild and scenic river in the United States that has been left un-dammed. No gas-powered crafts are allowed on this river. The Smith River may only be 25 miles long but it is still the largest river system in California that flows freely along its entire course. The Smith Steelhead are among the largest in the state and the river holds the record at 27 plus lbs. The Rowdy Creek fish hatchery supplement the natural runs of both Steelhead and Salmon. The best time to fish for Steelhead at the Smith is during the Winter season from December to April. Steelhead begin to enter the system behind the November/December Fall run of Salmon. The Smith is also home to cutthroat trout. 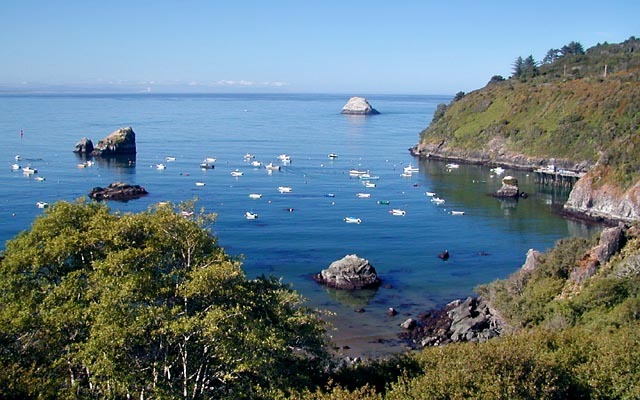 Located between Trinidad & Orick along Hwy 101 is a magical collection of landlocked waters, right on the coast but protected from the Pacific Ocean. The Humboldt Lagoons are a unique ecosystem providing unlimited outdoor recreation! Big Lagoon and Stone Lagoon are brackish because their ocean barriers are breached by storms nearly every winter and are a favorite fishing spot for cutthroat trout. Freshwater Lagoon does not get breached and is open all year featuring rainbow trout and black bass. Fish and Game code section 7153 provides for sport fishing from public piers without a sport-fishing license. All species, size and limit regulations apply to anyone fishing from these piers. I’m interested in booking a trip fishing for Trout on one of Northern California’s rivers. well fellas I hv some bad news, all well said for those fortunate enough to catch anything in the trinity river, eel river, mad river and ruth lake areas, Ive fished for 2 solid yrs I hvnt seen nor caught any trout of any species anywhere. Ive used all techniques even invented a few but nothing not even a bass.. theres plenty of comorants, native, hybrid and those dreaded UK ones too ! none stop eatters they are ! You’re haven’t tried everything or all of the places the fish are holding in. Or you just have really bad luck.